The lawsuit brought on by the Executive Branch vs the Congressional branch was judged solely on the separation of powers, not the true purpose for the lawsuit. The people and the Constitution gave the responsibility of oversight expenditures for all three branches to Congress and not to exceed the projected revenues. The opinion from the Judicial Branch didn’t consider the real reason for this unjustified lawsuit. The Chief simply didn’t want to give an itemized listing and specific information needed for Congress to make responsible appropriations for expenditures on the next year’s budget. In previous years the branches worked together on the itemized funding budget requests. Remember these are (or were) line item budgets, not departmental budgets. Supposedly the “Chief” bought the downtown bank building before notifying the Congress. The big question is WHY, and for what purpose? Was there a working business plan? Was there an unknown plan when purchased? This purchase had to include the attached building, which is fine, but the old Hernandez Restaurant building was included with this purchase. It has since been torn down. This is not the first time the Chief bought a building without notifying Congress. He bought the old corner buildings without any plan? O.K. at first this pawn shop was going to be an “interpretive” center – for what? Congress now has passed bill ONCA-17-109 for $400,000 to refurbish the above Bank Building. This was approved by those present. The “Historical Society” has the last word before any changes are done. I can’t believe the Osage Congress would even consider gutting such a beautiful historic building for any reason. 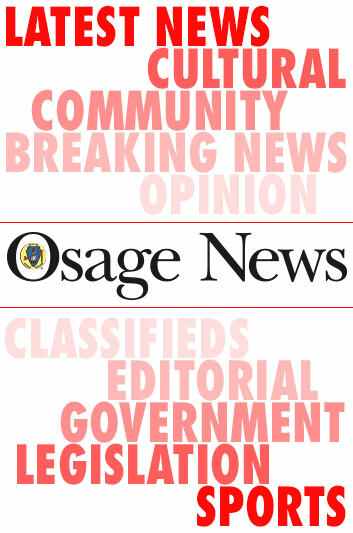 It’s important for Congress to be on the Osage campus, not downtown. The first floor, their current designated area of the building is not big enough for daily routine work, holding meetings, Congressional sessions, visits from business consultants, constituents, no designated parking, no handicap access or restrooms, the acoustics are nonexistent, small multiple teller areas only, etc. This will be a gut job and costs and unforeseen problems will be astronomical. When the refurbishing starts you can count on a trove of problems with modernizing the overall structure, building restrictions and codes with additional work to the other 4-plus floors, including the basement currently unoccupied. It seems that they want to be locked away from the people, which is troubling. I’m curious if there is a fire escape? It’s obvious you are not taking into consideration the future of the people. Congress members please do the right thing and come back where you truly belong. The Executive Branch needs to get a hand on the reclamation on the Congress building, this should have been done a long time ago. How could you let this go on for so long? We need some consideration and respect from our Elected Officials in order to work together.